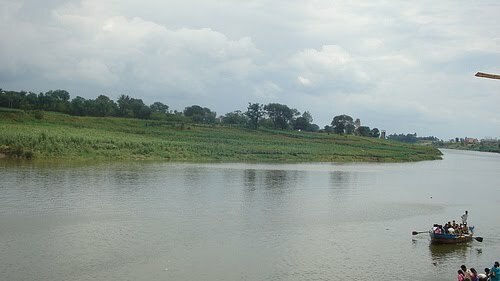 Anyway I went for a refreshing tour of 5 days in Maharashtra. We started on 8th and were back on 12th. The mandir is nice and not very crowded although there was a queue. But we soon reached in front of the murti and had darshan. Nearby the murty there was one person who was on loudspeaker giving pravachan. I actually don't like to listen to pravachan but during that period of time whatever i heard i liked it , may be bcz he was telling experiences which we all have sometime or the other. We also went to Kurundwad which is like at 15 minutes distance from Narsobawadi. Next day morning we went in one of the famous hotels Gokul in Kolhapur. 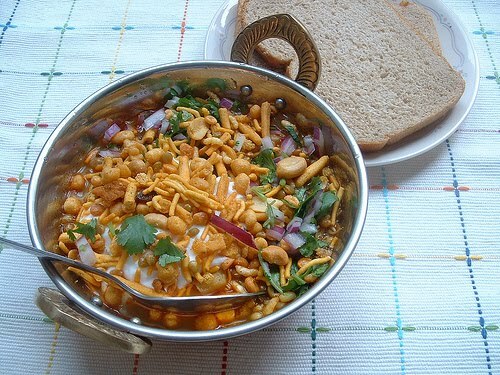 I had decided first only that I will have Kolhapuri Misal pav and mom also wanted to taste. Had heard a lot about it from Maharashtrian people. After 15 minutes I had lost patience . The waiter had served everyone with their dishes ( my other family members had ordered Masala dosa...... wow ) and I was sitting there with so many rats playing Bhangda in my stomach and watching everyone eating Masala Dosa. After more 10 minutes he served me Kolhapuri Misal. And I did not see left nor right . It was looking so good , cudnot wait to taste it. Basically Kolhapuri Misal is made out of sprouted lentils in spicy^spicy gravy ( called as KAT ) with toppings like onion , tomato and kurkurit chiwda , sev. ( See I do research on food ). And then I was feeling nice because everyone had finished eating their so called masala dosa and I and mom were tasting yummmmmmmmy spicy ...... Kolhapuri Misal Pav . In Kolhapur, we went to New Palace Museum. The Building looks magnificent and is architecturally beautiful which has influences of fusion of Hindu and Jain architecture. 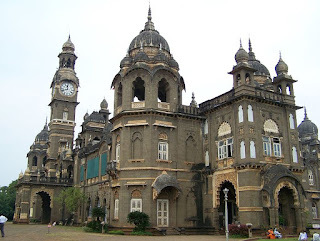 This museum is basically collection of possessions of Maharaja Shahaji Chhatrapati . There is fine collection of costumes , jewellery , embroidery . It also has one of the best collection of show pieces which is made out from elephants ivory tooth, legs of zebra, skin of tigers and leopards. Feel bad for the animals but the centre tables or bird cages made are really amazing and worth seeing. Also, the weapon collection is excellent. Not only simple swords but each with different kind and shape depending on the animal for which it is used for. There is also one of Aurangzeb's swords also. And one more thing. You should see the Darbar Hall . It is mind blowing ya . The ceiling has been carved so minutely and unique designs . Also it has been maintained beautifully, with exceptional care . Have you seen the darbar in the movie bhool bhulaiya ?? Its much adoring than that. We also went to the Ambabai Temple and Rankala Lake in evening. Did not take photos but. At night we went to Pune and boarded in some Hotel. We went in the temple in the evening. Last time we had gone to Shirdi it was not so commercialized . This time I do not know , I found it difficult. For keeping sandles, for taking flowers and whatever we take in pooja ki thali , there were these agents running here n there to attract people to their shop. Also inside the temple where there was a huge queue , there was a small shop opened which gave people cold drinks , ice-creams if you are tired . People were drinking cold drinks n throwing bottles there in the temple itself. Did not like this part. The queue was really unending. There were 3 lines in a big hall first , then via 2 staircases down , two up , one more hall and then darshan. But the thing is after all this hectic , when u see the beautiful " murty of Saibaba " you tend to forget everything and regret for nothing. ( Cudnot click photo but, this one is from web) . hey i realy love the way u describe food in ur blogs. it realy makes me feel hungry and i too start craving for it.